It's that time of year again apple & pumpkin season. This is the time that I go crazy and start baking and canning anything that requires apples and pumpkin. I just can't help myself. Golden Delicious and Granny Smith are the usual apples that I bake with. But folks there's a new apple in town.... The SweeTango Apple!!! I had never heard of these apples, but as part of the Walmart Mom's Program I was given the opportunity to sample a box. What is a SweeTango Apple you ask? Well it's a cross between the Honeycrisp (mom) and Zestarl varieties (dad). These apples are a blush apple with deep red coloration's over a yellow breaking background. Sweet Tangos are juicy, sweet and have a rich spicy fall flavor. To give you a little more information about the Sweet Tango apples, I have included a behind-the-scenes peek at SweeTango with Dennis Courtier, owner of Pepin Heights Orchards in Lake City, Minnesota. Mr. Courtier shows off his orchards on a bluff overlooking Lake Pepin and describes the care that goes into growing and packing SweeTango apples. We started off by snacking on a few apples and adding some to school lunches and my husband grabbed a few to take to work. The verdict.................. the kids they said they tasted just like an apple, but that's kids for ya. My husband said that they were really good and had a great sweet flavor with a nice crunch. I sampled a few myself and the apples were sweet, crisp and not grainy like some apples. I really liked the flavor and they weren't tart at all.The next test was to bake something with them. For me apples need to have a nice flavor with the perfect combination of sweet and tart. Those are the factors that make a great baking apple. I knew just the recipe to start with.... my mother in laws Fresh Apple Cake Recipe pictured above. With some apples they dissolve away in your cake, but this particular apple held up nicely. If I can find the sweetango's at the grocery store than I think I have found a new baking apple. I will share the recipe for the Fresh Apple Cake later this week. I also sliced some of the apples into a Spinach Apple Salad that I have been dying to try. I found this recipe in a issue of Kraft Food and Family Magazine. 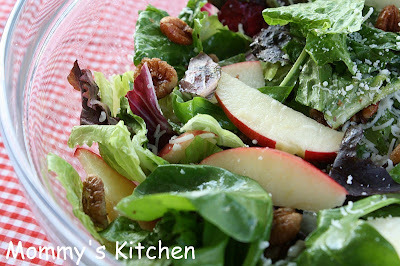 It had a mixture of spinach, a lettuce mix, sliced apples, red onion and candied pecan halves. 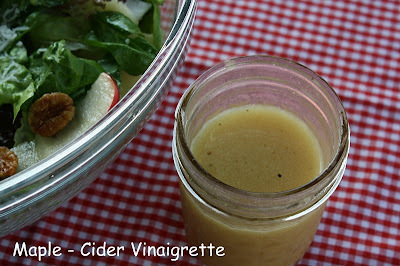 To finish it off I drizzled the salad with a maple cider vinaigrette. The SweeTango Apples will be available at Walmart around September 25Th. Next time you are at the grocery store stop by the produce section and give them a try. Our family loved them, so I know yours will too. To learn more about SweeTango you can visit there website at t SweeTango.com. You can also follow them on Face book and on twitter @sweetango. Prepare pecans by preheating oven to 350°. Toss pecans in butter. Stir together sugar and cinnamon in a bowl; add pecans, tossing to coat. Spread in a single layer in a nonstick aluminum foil-lined pan. Bake 10 to 13 minutes or until lightly browned and toasted. Cool in pan on a wire rack 20 minutes; separate pecans with a fork. Combine spinach and next 3 ingredients in a bowl. Drizzle with desired amount of Maple-Cider Vinaigrette; toss to coat. Sprinkle with pecans. Serve salad with any remaining vinaigrette. This is a sponsored post. I am participating in the Walmart Moms Program. Walmart & SweeTango have provided me with a sample box of apples and compensation for my time and efforts in creating this post. Participation in this program is voluntary and the opinions stated above are entirely my own. I love apples. Great recipes. Thanks for sharing. Don't you just love apple season? I do!!! So many great recipes to be made. I have managed to get through most of the fall without being homesick, but you managed to do it. As a kid, we always went to Lake City in the fall to see the leaves, get fresh cheese curds, and stop at the apple stores. I'm planning on trying the apple cake later this week. Thanks for the recipe! is it just me? i cannot seem to see/locate the apple cake recipe on this blog post. Sep I mentioned in the post that I will be sharing the apple cake reicpe later in the week. I will be posting it today or tomorrow, so be on the look out. thank you so much for those recipes!! i love cooking especially healthy foods. This salad is so yummy! We made it last night except I used a good Feta instead of the goat's cheese because that is what I had on hand. Thanks for sharing! I am making this beautiful salad tonight. I noticed in the picture that shows romaine(?) lettuce in it as well. My DH can't eat much spinach so I will sub romaine. Thanks for the great recipes. That apple bundt cake may be in order for dessert too!